A compilation I made with the pixel art of DiamondDMGirl, upscaling them. DiamondDMGirl posted this week on opengameart.org an asset of pixel-art. You'll find full walk-cycle for Pepper, Carrot, Saffron, Coriander and Shichimi. You'll also find a portrait for each characters. The pack is licensed as CC-By 4.0 license so you are free and encouraged to reuse this pack (or extend it). 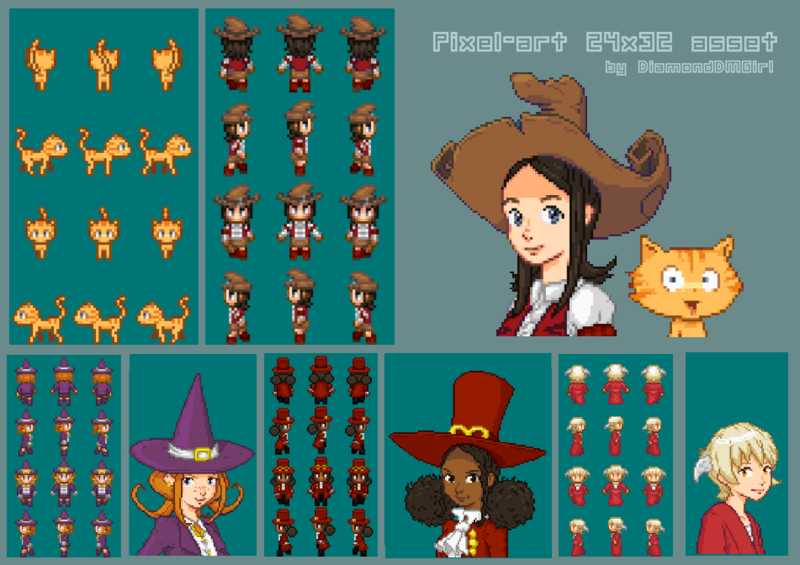 The necessary credit: "pixel-art: by DiamondDMGirl, based on Pepper&Carrot by D.Revoy.". Many thanks DiamondDMGirl for the pack, and for the very precise description on opengameart.org. License: CC-BY David Revoy, www.davidrevoy.com, 27 june 2017 .